In our last post, we were up-front with you and admitted that we’re Firefox fanboys and girls. We hope you appreciated our honesty. Today, we want to share about one add-on that made us fall in love with Firefox in the first place: Zotero. If you’ve ever struggled with keeping your research sources straight — particularly the ones you find while traversing the tubes, you’ll love Zotero. 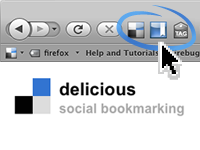 Once you download it, a spiffy little “Zotero” icon will show up in your browser’s bottom menu bar. Click on it, and a small panel will appear. This spiffy little panel is desisgned to automagically gather information about internet sources by scraping data off Web pages. Basically, whenever you visit a site that has a source which can be captured, a small icon will appear in your browser’s address bar. When you click on it, Zotero will grab the bibliographic information and populate a little virtual index card. You can edit the card, tag it, annotate it and link files to it. 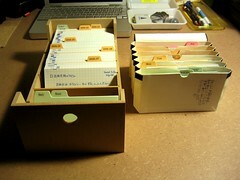 You can also organize all those cards/sources into various collections and export them into standard bibliographic formats. Right now, your Zotero collection can only live on one computer, but a new version is coming that will allow you to sync your collections across multiple machines. Zotero can scrape information out of all kinds of Web sites: library catalogs, newspapers, journals, even some blogs. And if a site doesn’t work automatically with Zotero, you can always add items manually. Remember, our philosophy at SfSS is to just try it out. So, if you’re not sure how Zotero could work for you, download it, install it, and start playing. Let’s Be Up-front about Stuff? Okay? In a relationship, it’s always good to get started on the right foot. So, we want you to know something really, really important about us here at SfSS. You might as well know that about us right from the start so there are no misunderstandings. We’d sure love it if you used Firefox too. It could provide some important common ground for us as we get to know each other. 1. Add-ons, Add-ons, Add-ons: Yep, Firefox has lots of them. An Add-on is just a small script that extends Firefox’s funcationality. You can find add-ons that do all sorts of things: inspect source code (if you’re the source code type), bookmark to del.icio.us (if you’re into that bookmarking thing), organize your bibliographic sources for a paper (yep, Firefox can do that with an add-on called Zotero), and so much more. Want to know more? Go check out Firefox’s add-ons page. 2. Standards: It’s important to have standards, right? I mean, our standards are what set up apart from the monkeys. (Or is that our use of tools? Whatever.) Lucky for us, the good folks at Mozilla know all about standards, and they’ve baked them into Firefox. What that means for you, lucky user, is that you can expect Web sites to behave the way they’re supposed to! And good behavior is almost as important as standards. An independent study shows that, in 2006, IE users were vulnerable to online threats 78% of the time. Firefox users? Only 2%. 4. 100% Organic: Okay. Truthfully, we’re not entirely sure what this means, but we hear organic is the way to go. And in these tough economic times, organic can be hard to find at a decent price. Guess what? Firefox is free! Anyway, we just wanted to get this whole “What browser do you use?” question out of the way early on. 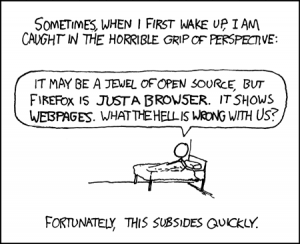 It can be so awkward to find out about browser incompatibility later. Perspective from XKCD used under CC Attribution-NonCommercial 2.5 License.